Parisian Ghetto is the fifth level in The Angel of Darkness and also in the Parisian Ghetto Section. 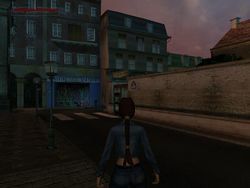 The location of the level is, as the name indicates, backstreets in Paris. There are various ways to reach the end of the level, and depending on the route you decide to take, you will need to pay money or receive items. The level requires no fighting; Lara is in the city looking for information. Parisian Ghetto is the first level where we can actually see Kurtis Trent, but he does not speak to Lara. You must return to this level after completing The Serpent Rouge. Afraid the police may find her, Lara spends the night inside a metro car. She now has Von Croy's notebook and after reading it, we find out about a man named Bouchard. Lara goes around asking about him from Homeless Men and a City Guide. Later, from Janice, Lara finds out about the Monstrum and it's most recent victim - Margot Carvier. Lara can receive information about him from either Bernard or Pierre. If you choose to look for Bouchard through Bernard you must agree to find his trinket box (located inside the Serpent Rouge) and also pay him 160 Euros. He will give you the Ex-Janitor's Key and now you can enter the club through the garage entrance. You can also find out about Bouchard with the help of Pierre, a bartender at Café Metro. If you agree to find and bring his trinket box, he will give you the Bartender's Key. You must use it to enter the nightclub through the stage door. However, you must decide to who you will agree to bring the box; once you agree to bring it to one of the two men, the other will refuse to speak to Lara. Explore the surroundings in order to gain access to The Serpent Rouge. There are not really any specific traps in the level. Completing the Parisian Ghetto may seem complicated as it consists of many sub levels. However, the main goal is to first choose between Bernard and Pierre to whom Lara will look for the Trinket Box in the Serpent Rouge. After retrieving it and giving it back, Lara is able to proceed to St. Aicard's Church where she'll get a lower body Power Up. This page was last modified on 6 December 2012, at 16:37.